I recently had the opportunity through Mom Fuse to try out some natural hair care products from Spirit Beauty Lounge. Now it may seem like cheating to start this review off by quoting their website, but I love how they phrase this and to me it's so important to buy good, natural, and ethical products! Reading labels and memorizing an ever growing list of ingredients to avoid can be overwhelming. On top of that, you may never know whether or not even "organic" products are ethically sourced or whether or not their packaging is eco-friendly. Spirit Beauty Lounge is a place where you can shop safe, knowing we've done the research for you! All of our organic and sustainable products come from companies who have clearly defined humane, ethical, and environmental policies ensuring the care of our planet and its inhabitants! First of all they sent me the Ctonics Tranquility Shampoo. The website claimed it wouldn't build up in my hair and was full of great extracts and oils and chamomile and rosewood. I gave it a whiff before hopping in the shower and it smelled quite nice. I was not expecting what came next. It's brown. Yes, you heard that right - brown. I've never used brown shampoo before, the stuff I always bought was white or colored pink or some other crazy color. But brown? Did I really want to put this on my hair? Since you know, I had to do a review and all. Guess what? I liked it! It doesn't lather up like conventional shampoos, as it doesn't have any of those yucky chemicals like sodium laurel sulfate, so I did use just a touch more than normal to kind of cover my whole head with it. The smell was great. In fact, so great it smelled like I was at a salon! The shampoo rinses clean, and my head actually felt cleaner than normal. Nothing was left in my hair at all! 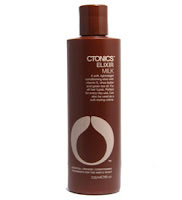 They also sent me the Ctonics Elixir Milk conditioner as well. This stuff is full of vitamin E, shea butter, and green tea oil. And it came out as expected, an off white color. I slathered it on and let it set for a few minutes before rinsing, and again, my scalp and hair felt clean with no residue, but this left a softness to it as well. So far I've used these about 5 times now and quite enjoy them. My hair even smells great throughout the day! I've wanted to try some natural hair care products for awhile now but always chickened out as I'm normally so afraid of how my hair will turn out. I've got curly hair and sometimes products just don't work. But these worked great, especially for the fact that they didn't leave anything behind! And even better for you - they are offering readers of my blog and of Mom Fuse 15% off anything on their site. Just use the code MOMFUSE at checkout!